I am on the horns of a dilemma… Hmm… that’s an interesting phrase. Wonder where it comes from. Was there a bull named dilemma and the rider is not sure whether to jump off while the going was good or… Sorry, I digress… as I was saying, I am on the horns of a dilemma. Just a half-hour ago I was all clear-headed.. no horns.. no bulls… I was looking ahead with eager anticipation. I have days ahead that are full of ..nothing… no deadlines.. no travel..no nothing. Finally! I can renew acquaintance with the bookshelf, I said to myself. Yaaay!! There’s Parva…. its eight-inch thickness had daunted a time-stressed me earlier. I can take it on now! Wait a minute.. I can first finish the India after Gandhi that I had abandoned. Nadine Gordimer.. Gosh.. I started that long ago. Oooh ..here’s Herriot.. ..why not set the mood with re-reading him. I pick each one out of the bookcase. My eyes fall upon the brand-new book on Service Design. I really ought to read that one 😦 But today is not an ‘ought to‘ kind of day, today is ‘want to‘! Perhaps tomorrow. The pile beside me grows and grows. Idea! I will create an area in the bookshelf to keep all the ‘to-read’ books together. Yesss! I spent the next hour selecting and de-selecting books to go onto the to-read now shelf. Lovely! All sitting next to each other.. so neat, so inviting. Kahneman jostling with Saki, fighting for space with Rumi. Perhaps I should arrange them by genre.. or should it be by book size …. or colour of the spine…. Wait a minute. I know.. I will do what I saw at Blackstones. The oldest (?) bookstore in Oxford. They had this brilliant shelf for the `dilemmaed’ ( I know, I know that word does not exist. Don’t quibble.Believe me, it’s not the right time). The books were all covered in brown paper with a verrry small hint on what was inside. 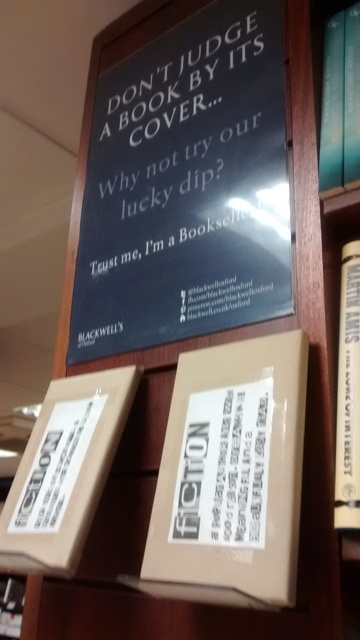 And they said..Don’t judge a book by its cover. . Why not try our lucky dip?.. That’s what I will do! Tomorrow. Today I buy brown paper.